Moet Hennessy has teamed up with Thirstie's beverage delivery service. Few brands have been able to associate their names with luxury likeDom Pérignon.Despite all the competition in the high-endChampagnespace,a "bottle of Dom" is still synonymous with letting people know you're out to have a good time at any price.Now,the famed champagne from producer Moët & Chandon is taking that reputation for excess to the next level – offering bottles of ready-to-drink,chilled Dom Pérignon delivered right to your door in under an hour. The service,which will allow customers to order a selection of current vintagesthrough Dom Pérignon's official website,is a partnership between the brand and technology partner and alcohol delivery service Thirstie,which works with local licensed retailers.Sadly for those looking to cement their social status in other parts of the country,the one-hour delivery will initially only be available in two markets,Miami and New York. (For the record,beyond Miami and New York,Thirstie also operates in Hoboken,Jersey City,Ottawa,Toronto,Miami,Austin,Dallas,San Diego,San Francisco,Minneapolis,and Chicago,and the champagne's website does state that "You can also subscribe to our emails to stay updated as we add new areas.") The places where Thirstie already operates would appear to likely future locations. 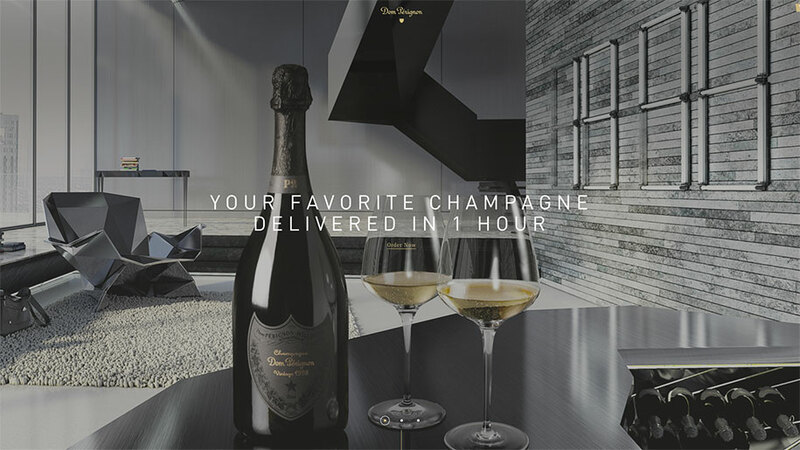 "A continuation of the Moët Hennessy USA ambition of innovation in the market,the launch of a 1-hour luxury delivery service for Dom Pérignon presents a new avenue in which to delight the Dom Pérignon consumer,in the on-demand and immediate world they live in," said Jorge Cosano,vice-president of Dom Pérignon,according to The Drinks Business. The service is already up-and-running on the Dom Pérignon website.In case you're wondering about price,we looked at having a bottle of Vintage 2006 sent in Brooklyn,and were quoted $174.98 for the bottle.Delivery is free,however,tax is an additional $15.52,and Thirstie suggested a $6 tip.It begs the ultimate question: How much do you tip a guy who delivers you a chilled bottle of Dom Pérignon in under an hour?We guess it's one of those things where if you have to ask,you really shouldn't be ordering Dom Pérignon delivery.